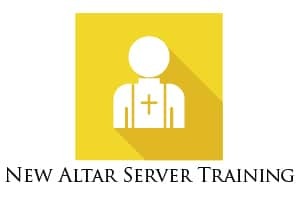 All Servers please mark your calendars for our first training session of the school year. Any young people grades 5th and older are encouraged to join us. We meet he third Tuesday of each month from 6:00-7:15 PM in the church. We will also be providing a few Sunday training sessions this year to accommodate busy schedules. All new Servers are welcome to attend our first meeting in September. Altar Servers assist the priest and deacon in the celebration of holy Mass so the liturgy can be conducted with reverence and grace. They assist Father by carrying the processional cross and candles, holding books, setting the altar and a number of additional jobs. This ministry helps our youth develop a sense of participation in parish life and a love for the church’s liturgical life, while growing closer to God. It also offers an opportunity to understand the rewards of service toward others and their community. It introduces them to new Catholic friends from many area schools. And where young people gather, there is always laughter and fun. It is a blessing indeed! At next Sunday’s Holy Mass, pay special attention our parish Altar Servers and the jobs they do, then imagine yourself in this role. Remember, we are praying for you. We look forward to seeing you soon! Please sign-up in the parish office or click here to sign-up online.